All-in-one simulator platform built specifically for flight simulation, creating the ultimate flight sim experience. Also great for racing and gaming. Create the ultimate flight simulator experience with the Gleim Virtual Cockpit™. 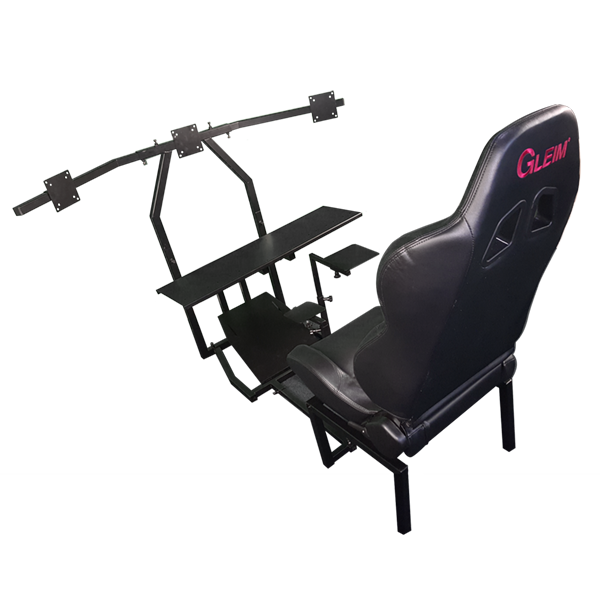 The all-in-one simulator chassis was built specifically for flight simulation. It is also great for racing sims and gaming, and can even be used as a computer workstation. The sports car style seat has multiple positions and reclines for maximum comfort. The heavy-duty steel-frame construction provides stability and durability. The triple-monitor mount is standard, providing the ultimate panoramic experience. The seat, monitor arms, and trays are adjustable so you can customize the setup to create the most realistic experience possible. The airplane is not always the best classroom. 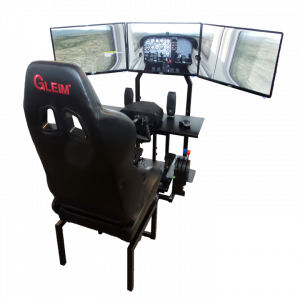 Operating under controlled conditions, the Gleim Virtual Cockpit is the ideal training solution for both VFR and IFR students. Flight schools, colleges and universities, and schools with STEM programs can also use the Virtual Cockpit to enhance training programs, saving students time and money, while creating safe, competent pilots. Well-prepared students are more likely to complete their training and recommend flight training to others. 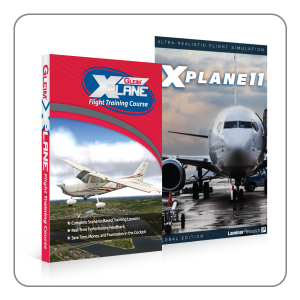 Combined with the Gleim X-Plane Flight Training Course, the Gleim Virtual Cockpit is the premier pilot training solution. 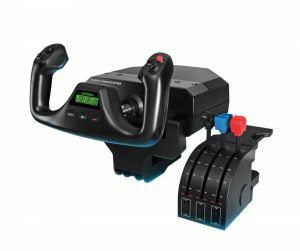 Compatible with a variety of peripherals from Saitek, CH, Logitech, Thrustmaster, Fanatec, and more. Articulating tray table is designed to easily attach peripherals such as yokes, flight sticks, racing wheels, and accessories with pre-drilled mounting holes. An easily removable center tray can securely hold a joystick. 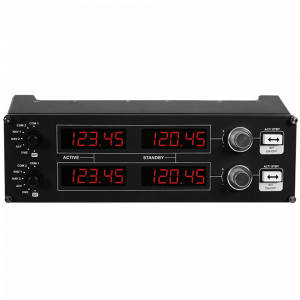 Side tray is designed to hold a throttle quadrant, trim wheel, mouse, or other accessories. Articulating foot or pedal tray supports a variety of pedals. Software, monitors, peripherals, computer, and electronic accessories are not included. 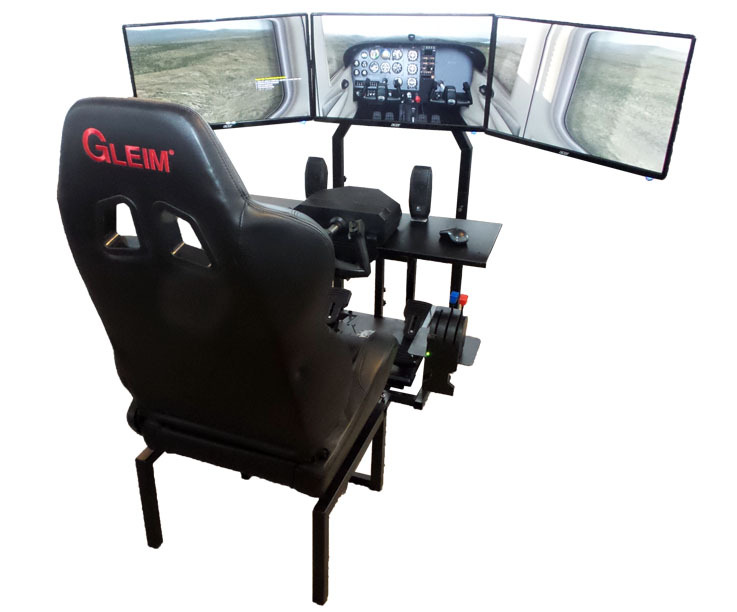 For a complete turn-key solution, with high performance computer system, monitors, flight controls, and accessories, check out the Gleim Virtual Cockpit Ultimate Set. The floor space required will depend on the configuration and size of monitors used. Minimum width is 34″. Using (3) 27″ monitors requires approximately 72″ width. Length is adjustable from 55″ to 72″. Minimum height is 47″ from the floor to top of seat. Monitor mounts are designed with standard 75 × 75 mm and 100 × 100 mm square hole patterns for M4 screw attachments to mount your display. These are commonly found on computer monitors and TV screens weighing up to 30 lbs. We recommend monitors up to 32 inches. Universal adapter brackets are available for displays requiring nonstandard or larger brackets. Assembly tools and hardware such as bolts, nuts, washers, and hex keys are included. Printed step-by-step instructions are included with a supplemental online video. Assembly takes approximately 30 minutes.